Lord Saville has already come under significant criticism for the time and money which has been swallowed up by the Bloody Sunday Inquiry. Future public inquiries could now be under threat as new Justice Secretary Ken Clarke has accused the Lord Saville of allowing the process to get “ludicrously out of hand“. The Saville Inquiry Report was published yesterday and can be downloaded here, a summary here and a good analysis here. 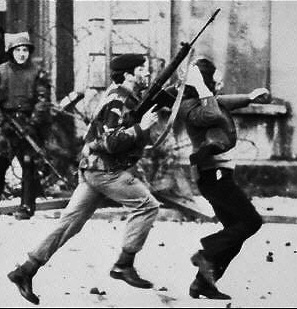 Lord Saville’s long-awaited inquiry into the Bloody Sunday killings of 30 January 1972 was set up to investigate the events surrounding a march in Derry when 29 protesters were shot by British soldiers, leading to 13 deaths. The Inquiry has been widely criticised prior to its findings. If the uproar over Bloody Sunday leads to other inquiries being downsized or cancelled, however, this may leave the state vulnerable to human rights challenges arising from the wide (and widening) obligation upon the state under human rights law to properly investigate deaths. Article 2 of the European Convention on Human Rights provides legal protection for everyone’s right to life. In some circumstances this includes an obligation on the state to investigate deaths and ensure the investigation is properly conducted. Since the passing of the Human Rights Act in 2000, the duty under Article 2 has resulted in a proliferation of public inquiries as well the increasing importance of coroners inquests, particularly for the relatives of the dead. The purposes of such an investigation are clear: to ensure so far as possible that the full facts are brought to light; that culpable and discreditable conduct is exposed and brought to public notice; that suspicion of deliberate wrongdoing (if unjustified) is allayed; that dangerous practices and procedures are rectified; and that those who have lost their relative may at least have the satisfaction of knowing that lessons learned from his death may save the lives of others. This investigative duty is most often discharged by way of coroners inquests and public inquiries, although the distinction between the two is becoming increasingly less clear as inquests become longer and more complex. Coroners inquests are legal inquiries into the causes and consequences of a death triggered by unusual circumstances, for example, as a result of a violent act, accident, injury or surgical operation. Inquests are only meant to concentrate on the “factual” circumstances surrounding a death, and as such are not supposed to result in criminal or civil blame. However, in recent years coroners have often been providing “narrative” verdicts which can include a finding of “neglect” or “unlawful killing”. The idea that coroners inquests do not lead to criminal or civil liability has therefore become something of a legal fiction. For example, coroners have repeatedly used their jurisdiction to criticise the Government over army equipment failures. The wider role of coroners inquests has also eroded the distinction between inquests and public inquiries, becoming longer, more complex and requiring full legal representation; for example the long and expensive inquest into the death of Princess Diana. The upcoming inquest into the 7/7 bombings is likely to accelerate this trend, with the coroner, Lady Justice Hallet, saying that she will investigate the role of MI5 and police prior to the 2005 terrorist attacks. The position of coroners is soon to undergo significant changes as a result of the passing of the Coroners and Justice Act 2009, although the schedule for its implementation is yet to be decided. When implemented, the Act will create a national framework for the coroners system, the absence of which has thus far led to wide variations in the style and substance of corners inquests nationally. It will also create the office of the Chief Coroner, Her Majesty’s Inspectorate of Courts Administration will, for the first time, be able to inspect coroners’ courts. This will subject coroners courts to similar scrutiny as public inquiries have been placed under as a result of the Inquiries Act 2005. Public inquiries – out of hand? Historically they have ranged from events which suggest a breakdown in the rule of law, such as the Scott Inquiry, through those which have caused a single death, such as the Victoria Climbié Inquiry, to matters that concern numerous deaths, such as the Shipman Inquiry or the Marchionness-Bowbell Inquiry. The common factor in every public inquiry is the pressing public concern that something has happened that must be investigated openly and fairly by a body that is independent of the problem. There have been around 40 major public inquiries in the UK since 1990, and 20 in the past decade. The most high-profile in recent times has been the Chilcott Inquiry into the Iraq war, much of which was for the first time broadcast over the internet, therefore emphasising the role of public inquiries to subject controversial issues to public scrutiny. Public Inquiries proliferated under the previous government, albeit on a much smaller scale than the Saville Inquiry. Upcoming inquiries include the Al Swaedy Inquiry into allegations of the unlawful killing and mistreatment of Iraqis by British soldiers after the “Battle of Danny Boy” in Iraq in 2004. This was set up by the previous government and follows the Baha Mousa Public Inquiry into other deaths in Iraq, which has just completed its oral hearings. It was not just the previous Government which had a taste for public inquiries, however. Since coming to power, the Coalition government has promised two new wide-scale inquiries; into complicity in torture by the British government during the ‘war on terror’, and into failings hundreds of possibly unnecessary deaths at Stafford Hospital. Both inquiries are the result of legal challenges by the families of the dead. The Saville Inquiry cost around £205m, if the £15m costs of moving the Inquiry to London are included in the final sum. But as we posted last week, due to changes in the law resulting from that inquiry, it would not be possible for the same to happen again as the government now has much more control. The Inquiries Act 2005 gave ministers new powers to set the terms of reference of an inquiry, withhold costs if part of an inquiry goes beyond those terms of reference, or even suspend or terminate the inquiry. The Justice Secretary’s comments in relation to future public inquiries will be of worry to those who have been affected by various government-linked disasters and who have been promised full public inquiries. It may be that the new Justice Secretary is following the example of his colleague in the Home Office by riding a wave of public anger which in reality aims to deflect criticisms back to the previous government. In reality, Ken Clarke will be well aware that the Bloody Sunday Inquiry cannot be taken as a typical example of a modern public inquiry. Rather, its cost and overrun was precisely what led the last government to drastically increase its powers to prevent inquiries getting out of control in the future. By contrast to the £200m which it is claimed the Saville Inquiry cost, the Baha Mousa Public Inquiry, which is drawing to a conclusion, has so far cost over 20 times less. It may be the case that there simply isn’t enough money available to pay for public inquiries and inquests on the scale seen in recent years. But, any restrictions on the resources provided in order to fulfil its investigative obligation will almost certainly leave the state vulnerable to human rights challenges. The Royal Commission on Tribunals of Inquiry under the chairmanship of Lord Salmon recommended that some of the procedural safeguards of the legal system should apply to public inquiries… The Salmon recommendations were never enacted, but the practice, until the Scott inquiry on arms to Iraq over four years in the mid-1990s, has been to adopt the legalisms of Lord Salmon, including, vitally, the issue of “Salmon letters” to individuals alerting them to potential criticism. The legal rights of witnesses are not directly in jeopardy. At worst, their reputations are at stake. One is driven to the conclusion that, until the Inquiries Act 2005abolished the 1921 act, tribunals had been hijacked by the legal profession… Public inquiries should, as was always intended, be essentially creatures of public administration, and not be regarded as a means of pinning the blame on individual parties.